BAGUIO CITY – Some P4 million was earmarked by the local government under its P2.179 proposed 2019 annual budget for the possible rehabilitation and replacement of the existing facilities within the children’s playground at the Burnham Park complex for the safety and convenience of park goers. The amount was lodged under the proposed annual allocations for the City Environment and Parks Management Office (CEPMO), the concerned department in the local government in charge of supervising, monitoring and administering the operations in various parks in the different parts of the city. CEPMO representatives claimed the funds will be utilized by the local government to replace the outdated facilities in the children’s park with new slides, swings and other basic facilities for use of park goers and ensure children’s safety when they use the facilities. While the local government entered into a memorandum of agreement with the management of SM City Baguio for the upkeep of the children’s playground, the duties and responsibilities of the giant chain of malls is purely for the maintenance of the park and its existing facilities. Part of the facilities put in place by SM City Baguio were the lighting fixtures at the back portion of the children’s playground apart from the re-painting and maintenance of existing facilities that have been put in place by the city for years now. Earlier, the management of Tiong San also signified its intention to help the local government in the upkeep of the children’s playground but the company’s proposal was instead diverted to the Rose Garden considering the city’s existing live agreement with SM City Baguio. 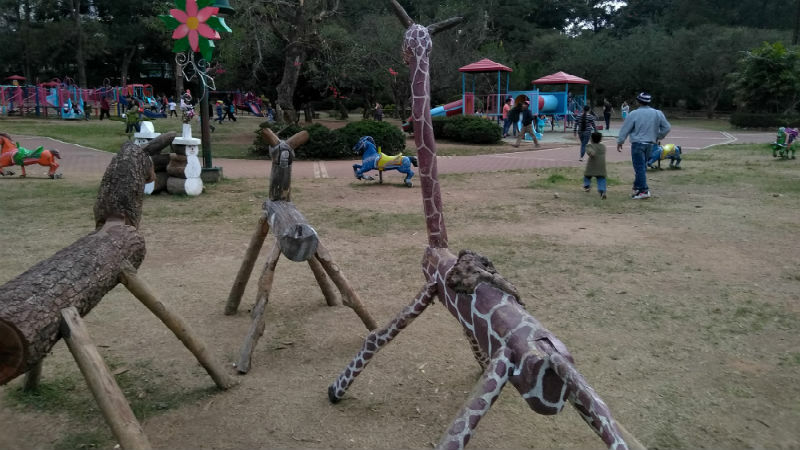 The children’s playground is part of the 34-hectare Burnham Park Complex turned over by the national government to the local government for the same to administer, manage and operate it pursuant to Executive Order No. 24, Series of 1995 issued by former President Fidel V. Ramos and Executive order No. 695 issued by former President and now House Speaker Gloria Macapagal-Arroyo. However, the national government through the tourism department failed to include the provision of funds to augment the local government’s resources for the sustainable administration, management and operation of the park. Mayor Mauricio g. Domogan had time and again repeated that the local government is heavily subsidizing the administration, management and operation of Burnham Park because it actually spends over P4 million annually for the park without the implementation of major infrastructure while it only generates less than P12 million from existing concessionaires that had been in place in various parts of the park over the past several decades. He argued that returning back the administration, management and operation of the park to the Tourism Infrastructure and Enterprise Zone Authority (TIEZA) will be detrimental to the greater interest of the people of the city as had been the experience when the same was under the tourism department.